So, a few weeks ago, Shannon of 1-2-3 Healthy Nails kindly offered me to review the Starter Kit. 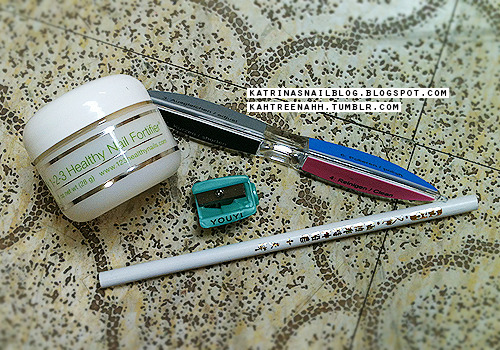 1 oz jar of the Healthy Nail Fortifier, a buffing file, a French manicure pencil, and a pencil sharpener. According to the instructions, you're supposed to use this product for about 2 weeks. You buff your nails once a week, apply the nail fortifier twice a day (once in the morning, once in the evening), and use the french manicure pencil once a day. There is a very informational video here. Less shiny but it still looks alright :P The fortifier has a ... different smell. The smell isn't bad and it's definitely bearable. I don't eat oatmeal but the fortifier kind of looks a tiny bit like oatmeal. I'm very doubtful of products that 'help nails grow stronger' because they don't always work ... but this product -honestly- worked for me. I'm sad that I didn't photograph my right hand because my right hand pointer finger was ripped; after two days of using the fortifier, the rip had completely disappeared. Don't ask me how, because I don't know how it happened, but I was so excited. I didn't really find the pencil necessary, that didn't really do a difference for me .. but besides that ... my nails really did get stronger. Another case of the product working for me ... I have a really bad case of the 'peel-ys' ... I always peel the nail polish off my nails. Now, we all know that's not a smart thing to do (unless you're using the peel off base coats .. but in this case, I wasn't). 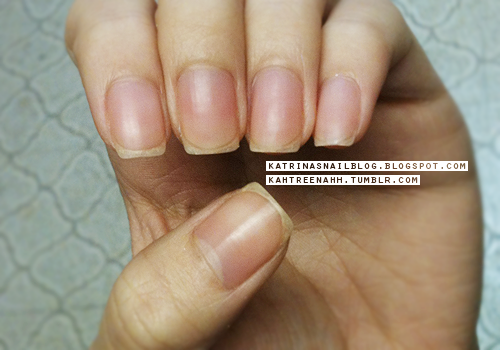 My nail was all disgusting -- I peeled off a few layers of my nails :( So, I decided to try the Healthy Nails Set again ... I buffed my nail, applied the fortifier, and then two days later ... BAM! My nail looked so much better! Picture 1 - yes, very gross. 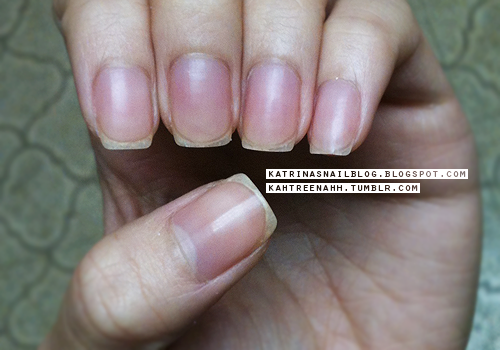 Proof that you should not peel the nail polish off your nails cause it will damage your nails. Picture 2 - same night as picture 1. After I buffed my nail & applied the fortifier. You can kind of see a rip at the tip of my pinky nail. Picture 3 - two nights later; almost all better ! :) I did do a tiny bit of filing on the nail but it still looks much better~ The rip in the nail was less noticeable as well. There goes two examples of the 1-2-3 Healthy Nails Starter Kit working for me :) I can't guarantee the same results but I do definitely recommend people with weak, brittle, and chipped nails to try it out. I always skeptical about buffing my nails because it makes them weak but sound of "fortifier" is very interesting! 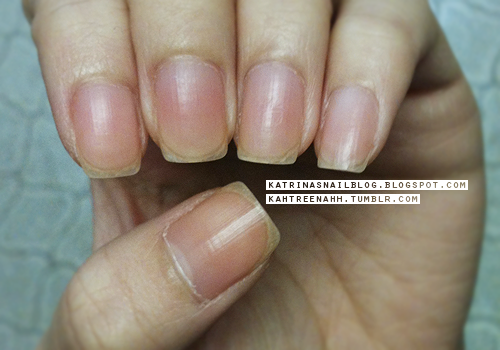 I have terribly weak, brittle nails! It's quite frustrating growing them long because they get to a certain point and the next thing I know, I have a chip at the end or a tear on the side. That kit did wonders for your nails. They look super beautiful.